Get 30% off your next order at Craghoppers with this exclusive discount promo code. Craghoppers proudly present this discount code to all TroopScout users: serving members, ex-forces, family and friends. First established in 1965, Craghoppers is a prominent retailer specialising in outdoor adventure and travel clothing as well as accessories and equipment to boot. Their mission is to get customers prepared for their greatest adventures by developing and designing the best gear possible, and with over 50 years experience under their belt you can expect Craghoppers to deliver. By continuously working towards creating practical and comfortable gear, Craghoppers has come up with innovative designs that uses the latest fabric technologies designed to give you the best protection against the elements keeping you warm, dry and protected from sun exposure. Most impressive is the NosiLife range; a first in permanent insect repellent clothing. Using innovative technologies, Craghoppers are the first to design a clothing range which acts as a protective barrier against insect bites. With a lifetime guarantee on clothing and equipment for all customers and an average score of 91% from over 5,500 happy reviewers, Craghoppers is definitely the best equipped to deal with the needs of your upcoming adventure! Discover your love for the outdoors today. 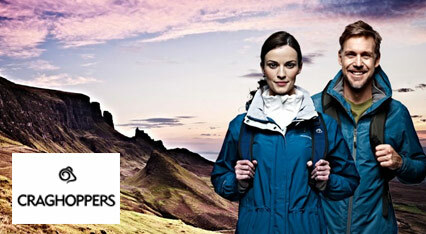 Click ‘Get Code’ to get the voucher code and open the Craghoppers website. Once you’ve selected the items you want, add them to your basket. When you’re ready to purchase your items, click on the basket icon in the top right corner and then Go to Basket’ in the drop down box. Underneath your basket you’ll find it says ‘Promo code’. Type in the TroopScout voucher code into the box provided below it. Click ‘Apply’. Once your discount has been applied, click ‘Checkout’ on the right hand side to continue. If you’re a returning customer, fill in your email address and password. Click ‘Sign in and Continue’. If you’re a new customer, click ‘Continue’ on the right hand side. This discount excludes The Ultimate Travel Collection. Valid on full priced items only.